The quality is checked at all stages in a well equipped laboratory for the testing of molten metal and final product compositon, micro structure, tensile strength and hardness with micro – hardness tester. Quality control is ensured through process supported by well equipped laboratory and experienced professionals. Better and Attractive surface finish and surface preparation for any type of surface painting , coating, or other applications. Long Life due to close control of material properties. HSM NO. SAE NO. BIS NO. 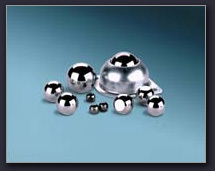 The above shots aremanufactured from electricity melted steel, casted by specially controlled process and then suitably heated for optimum results. Quality control is ensured through process supported by well equipped laboratory and experienced professionals. We have a dedicated team of professionals, with their total commitment to our common goal of quality product manufacturing followed by timely supplies and ensuring total customer satisfaction. The top management regularly conducts management system planning meetings and training programs to ensure total system implementation. Well defined procedures are laid down in a manual and strictly adhered to at various levels of production and testing under actual working conditions resulting in a guaranteed quality product.